Now that iPod FM tansmitters are widespread in the UK - and given that this cradle is compatible with XtremeMac's own AirPlay - this in-car nano holder should appeal to many of the iPod-toting public. 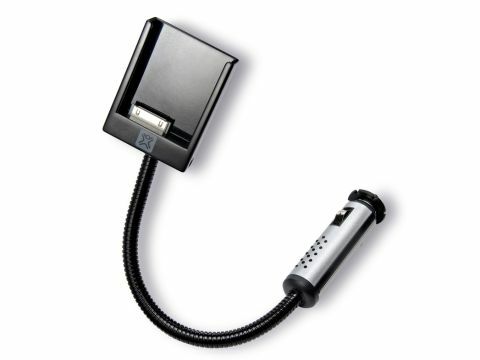 The cradle comes with a cigarette lighter coupling that will charge up the nano as you drive along. The flex cable that connects the socket adaptor to the cradle is strong, but still malleable and a good length. The dock on the bottom of the cradle has an audio-out socket in the form of a 3.5mm jack; if you dock an FM transmitter with this audio-out you'll be able to tune your car stereo to the iPod. Not all FM transmitters will work with this type of jack, so check yours does.